Pro-Level Speed Training Tool & Radar Gun Range: 120 feet on a baseball Accuracy: +/- 1 MPH (+/- 2 KPH) Measures from: 25 to 130 MPH (40 to 209 KPH) Size: 4.7 inches (H) x 2.3 inches (W) x 0.8 inches (D) Weight: 4.5 ounces with two AAA batteries Recall Memory: previous 25 speed readings Includes 2 year warranty. Fits in the palm of our hand. Made of solid rubber and weighs one pound. Perfect to acquire for rehab therapy, muscle toning, muscle memory, and as a basic warm-up before game. Available in red, blue, yellow, and ORANGE!!! 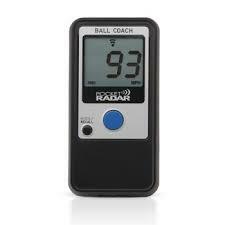 Number 1 selling throwing training aid in the USA. The ThrowMAX gets the job done!